Hyundai Construction Equipment Americas featured a variety of recently upgraded models and newly available third-party attachments at World of Concrete, held last January in Las Vegas. The company also displayed its Hyundai HX130LCR hydraulic excavator for the first time since the model’s recent introduction. The HX130LCR is the 3rd compact-radius excavator model in the company’s HX series product line. The 12.25-t machine also is available in a second standard configuration, the HX130LCRD, which includes a dozer blade. The unit displayed at World of Concrete was outfitted with an Antraquip hydraulic cutter, designed to cut rock, concrete or asphalt for a variety of applications. 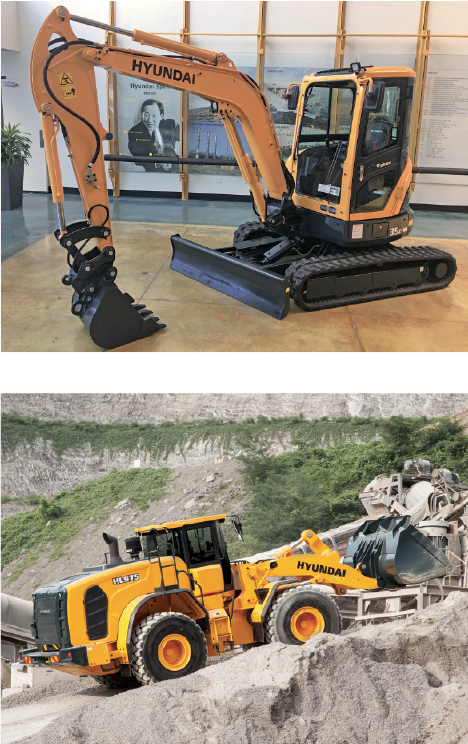 The Hyundai exhibit also included the Hyundai R35Z-9A compact excavator, which was being exhibited for the first time since a recent spate of upgrades including an available 4-way angle dozer blade. The 3.2-t Hyundai R35Z-9A features a zero-tail swing design for optimal maneuverability in confined work spaces. It comes with a Werk Brau-compatible thumb bracket, a diverter valve for easy switching between a thumb or attachment, proportional control levers with 2-way piping, pin-grabber style dual-locking quick coupler and O/C piping, enhanced bucket design with lifting-eye and 2-piece tooth design for easy replacement, increased curve profile on dozer blade for better grade and cutting ability, an easily replaceable cutting edge to the dozer blade, a wider opening engine compartment, and a durable centered boom LED work light for improved jobsite illumination. Another featured model at Hyundai’s exhibit was its HL955 wheel loader, outfitted with a GEM Attachments heavy-duty performance bucket and hydraulic coupler. The GEM GP bucket is designed for use in general purpose and abrasive applications. It features a reinforced bucket shell to extend the bucket life, internal liner plate for maximum wear protection, reinforced bucket edge and bolt-on corner protectors to improve pile penetration, and V-style spill guard to product the machine linkage from damaged caused by debris spillage. Hyundai also exhibited its HL975 wheel loader, a model well suited for digging and loading in quarries, gravel pits, surface coal mines and other high-production applications. Finally, World of Concrete visitors could see a Hyundai HX220L hydraulic excavator at work in the MB Crusher outdoor exhibit, demonstrating a MB rock-crushing attachment.